A time lord named 5 Ply is late on his bills, so he decides to send some business cards through time and space to find some customers looking for an adventure to raise the needed funds. The Turtles receive a card in the mail and use it to teleport themselves to 5 Ply’s castle, where they’re promptly told to wait for assistance. Raph isn’t happy about this, so he and the TMNT head off to find some help. 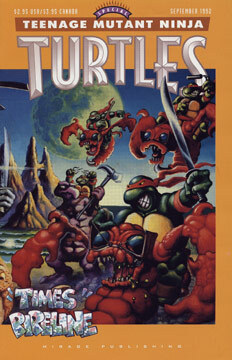 5 Ply and his assistant, a basketball-sized metallic ball named Doom Marble, find the TMNT exploring in areas where they shouldn’t be, carrying “unauthorized weapons.” Doom Marble attacks and the Turtles are forced to flee the wrath of the strange machine… unfortunately they’ve hidden themselves in a room full of equipment that’s about to be teleported! Soon the TMNT find themselves on the surface of a jungle world. Oddly, their faces have been altered by the teleportation (their features now resemble the famous Bode lizards). The guys are attacked by some flying crab insects, while soldiers in a nearby tower look on in disinterest. The Turtles win their battle and head into the jungle for cover. The next morning, the TMNT head out to do some exploring and discover that the soldiers are capturing huge animals and using massive machines to slice and dice them into processed meat. Don wonders if the meat is being teleported off the planet, and the guys hitch a ride on a dead animal to investigate – only it’s not dead! The behemoth rises and attacks the vehicle that seconds earlier had been hauling it towards its demise. Suddenly, the Turtles find themselves in the middle of a war between the native inhabitants of the planet and the exploitive soldiers. The TMNT join the fray, deciding that they’ll need access to the fortress to teleport themselves back home. The TMNT help the native species defeat the soldiers and are able to use the teleportation device in the fortress to return to 5 Ply’s castle. When the time lord demands payment, the TMNT inform him they’re broke, so 5 Ply angrily sends them back to their own time… but not place.